From Route 691, take exit 3. Going east (heading towards Meriden/I-91) on Route 691, take a right at the end of the exit ramp onto Route 10 South. Take left at next light onto E. Johnson Ave. Going west (towards I-84), take a left at the end of the exit ramp and go back over the highway. At the 2nd light, take left onto E. Johnson Ave. Stay on E. Johnson for approximately 1.2 miles. You will pass DeLucia Greenhouses on right, go over a bridge, and up hill to stop sign. 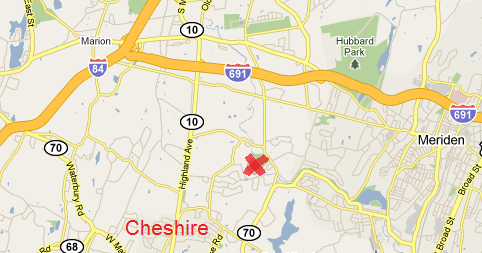 Turn right at stop sign onto Cheshire Ave. Drive .9 miles and take right into Quinnipiac Recreation Center. Route 10 North to Route 68/70 East. At the intersection of Route 10, 70/68 East, follow signs for 70/68 East. Drive for 1.2 miles to where Route 70 and 68 split. Continue straight on Route 70 East for about 2 miles. Just after you pass a huge greenhouse complex on your right, the road will curve sharply to the right. Veer left here onto Cheshire St. Continue on Cheshire St. over a small bridge. Bear left after bridge to stay on Cheshire St. The park entrance is a little less than 1/2 mile on your left. I91 exit 15. Going north, take left at exit light onto Route 68 West. Going south, take right at exit light onto Route 68 West. Drive about 6 miles on Route 68. At the intersection of Route 70 West, take a right on Route 70 East (S. Meriden Rd.). Continue straight on Route 70 East for about 2 miles. Just after you pass a huge greenhouse complex on your right, the road will curve sharply to the right. Veer left here onto Cheshire St. Continue on Cheshire St. over a small bridge. Bear left after bridge to stay on Cheshire St. The park entrance is a little less than 1/2 mile on your left.